The Sakuya Konohana Kan conservatory was established by Osaka Municipal Government as a pavilion of the International Garden and Greenery Exposition, Osaka, Japan 1990, held from April 1 to September 30, 1990. 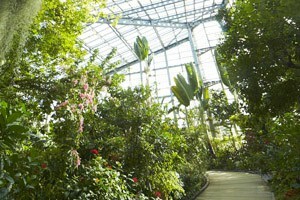 In line with the theme of the exhibition, “Harmonious Co-Existence between People and Greenery,” the conservatory houses wild plants collected from around the world. 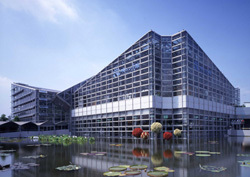 This is one of the largest conservatories in Japan, and one of the few conservatories in the world that artificially maintains the climatic and geographical conditions of the regions where the plants grow. Plants that are the main attractions of the conservatory, such as tropical water lilies and blue poppies, are made to bloom all year round. 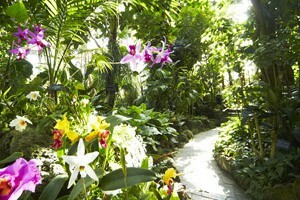 There are approximately 15,000 plants of 2,600 species and garden origins on exhibit, which offer direct and hands-on opportunities for visitors to learn about the wondrous nature of our precious planet in depth, while inviting them on a fascinating journey to appreciate the flowers of the world. 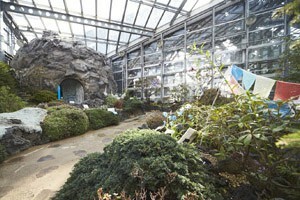 In the Sakuya Konohana Kan conservatory, plants are arranged by climatic/geographical zone as shown below. It is estimated that there are approximately 25,000 orchid species around the world and about 70% of them are epiphytic species that grow on trees. 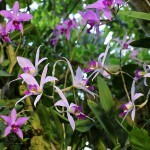 This section features seasonal orchid species, including epiphytic orchid species such as Dendrobium and Oncidium; the world’s largest orchid species, Grammatophyllum speciosa; and a terrestrial orchid species, Paphiopedilum. 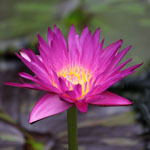 Colorful red, white, purple and yellow tropical water lilies offer a breathtakingly beautiful sight all year round. In the pool, where water temperature is kept at around 28℃, you will marvel at giant water lilies (Victoria amazonica) known for their large leaves on which a child could easily sit. A brackish-water region where river and sea meet and freshwater and seawater mix is a difficult environment for plants to survive. 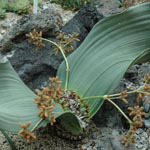 However, some plants have successfully evolved to adapt themselves to the harsh environment, with their specialized supporting roots, growing very well in this environment. Such species include Bruguiera gymnorhiza, Kandelia candel and Rhizophora mucronata. 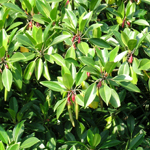 As is widely known, these kinds of plants and the areas where such plants grow are collectively called “mangrove.” Have a close look at the unique mangrove around the pond. This zone reproduces a beautiful tropical landscape, like that of Hawaii or Tahiti. 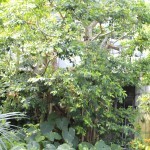 Here, you can enjoy a variety of tropical plants, including well-known tropical flowers such as hibiscus (Hibiscus) and bougainvilleas (Bougainvillea), seasonal flowers such as jade vines (Strongylodon macrobotrys) and fruits such as bananas (Musa) and pineapples (Ananas). Flowers in this zone include powder puffs (Calliandra), colorful flowers indigenous to South America that resemble cosmetic puffs; African tulip trees (Spathodea campanulata) which bear a cluster of orange flowers that look like tulips; and jade vines (Strongylodon macrobotrys) from the Philippines whose jade green flowers are strikingly beautiful. Some flowers are planted permanently, while others are replaced from time to time so that visitors can enjoy seasonal flowers at their best. 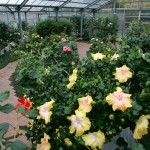 Which hibiscus plants do you like better, the wild species or garden origins? If you prefer simple beauty, Hibiscus waimeae and Hibiscus kokio saintjohnianus, the hibiscus species native to Hawaii, may fascinate you. 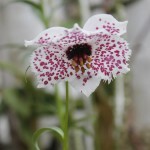 Or you may find “the very fancy garden origins”, such as ‘Painted Lady’ and ‘Rainbow’, more attractive. In arid areas plants have evolved to have very unique shapes to withstand drought. This zone shows these curious plants that grow in five areas of the world: Africa ? aloes (Aloe spp.) and welwitschias(Welwitschia mirabilis); Madagascar ? baobabs (Adansonia) and kalanchoes (Kalanchoe); North and South America ? cacti; and Australia ? bottle trees (Brachychiton populneus) and grass trees (Xanthorrhoea). The arid areas in Africa are home to unique aloe species, such as edible Aloe vera, and Aloe dichotoma that grows as high as four meters. 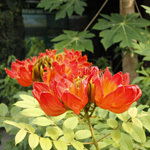 Other curious plants include welwitschias that have only two leaves and, astonishingly, can live more than 5000 years! ; there are also desert candles (Euphorbia abyssinica) that look like cacti, but belong to the poinsettia family which are popular Christmas decorations. Plants from the cactus family are distributed in North～South America except Rhipsalis plants that grow in S.America and Africa. 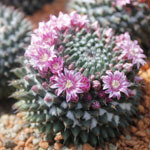 One representative is genus Mammillaria which bears lovely flowers in spring, such a contrast with their spiny bodies. Growing alpine plants indigenous to areas up to 5000 m above sea level, requires that the room temperature is kept at lower than 20℃ even during the peak of summer. Here, alpine plants from the Himalayas, China, Japan, Europe and America are grown in their native conditions to the greatest possible extent. Blue poppies (Meconopsis) are found in high-altitude habitats 3500 m or more above sea level, from the Himalayas to Sichuan Province in China. 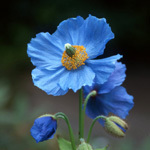 Genus Meconopsis consists of more than 40 species such as Meconopsis betonicifolia and M.grandis (blue flowers), M.punicea, (red flowers) and M.integrifolia (yellow flowers). Here, these flowers are made to bloom artificially almost all year round. 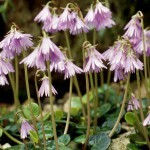 You can enjoy attractive alpine plants that grow in the area known as the “roof of the world” and that are rarely seen in Japan, which include Primula flowers (genus Primula); lilies and Nomocharis flowers (Nomocharis) that are closely related to lilies; rhododendrons (genus Rhododendron); and blue poppies (Meconopsis). You can enjoy lovely seasonal alpine flowers, such as edelweiss (Leontopodium alpinum), which became well-known thanks to a famous musical, as well as horned rampion (Phyteuma),harebell (Campanula rotundifolia), snowbell (Soldanella),and cranesbill(Geranium), all flowers that cover alpine meadows. A cool, pleasant breeze will transport you to the European Alps, though you cannot hear your voice echoing in the mountains. This area reflects the views which hikers see in high mountains. 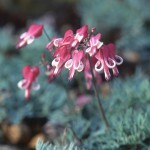 You will find many alpine flowers, including Dicentra peregrina, Callianthemum hondoense, Geum pentapetalum, Cassiope lycopodioides, plants of the genus Primula such as Primula heterodonta, and many others. Representative alpine flowers are made to bloom all year around. A restaurant and shop are housed in the Sakuya Konohana Kan conservatory, which are open during normal conservatory hours. About a ten-minute walk from Tsurumiryokuchi Station on the subway Nagahori Tsurumiryokuchi Line. 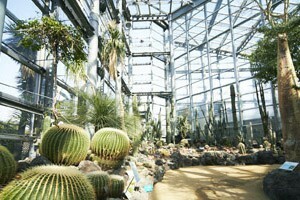 The Sakuya Konohana Kan conservatory is a glass-covered building adjacent to the observation tower in Tsurumiryokuchi Park. About 54 minutes from the airport to Tennoji Station on the JR Hanwa Line (by Kanku Express), about 14 minutes from Tennoji Station to Kyobashi Station on the JR Osaka Loop Line (inner loop), and about nine minutes from Kyobashi Station to Tsurumiryokuchi Station on the subway Nagahori Tsurumiryokuchi Line. About 12 minutes from the airport to Senrichuo Station on the Osaka Monorail, about 26 minutes from Senrichuo Station to Shinsaibashi Station on the subway Midosuji Line, and about 21 minutes from Shinsaibashi Station to Tsurumiryokuchi Station on the subway Nagahori Tsurumiryokuchi Line. About six minutes from JR Osaka Station to Kyobashi Station on the JR Osaka Loop Line (outer loop), and about nine minutes from Kyobashi Station to Tsurumiryokuchi Station on the subway Nagahori Tsurumiryokuchi Line.